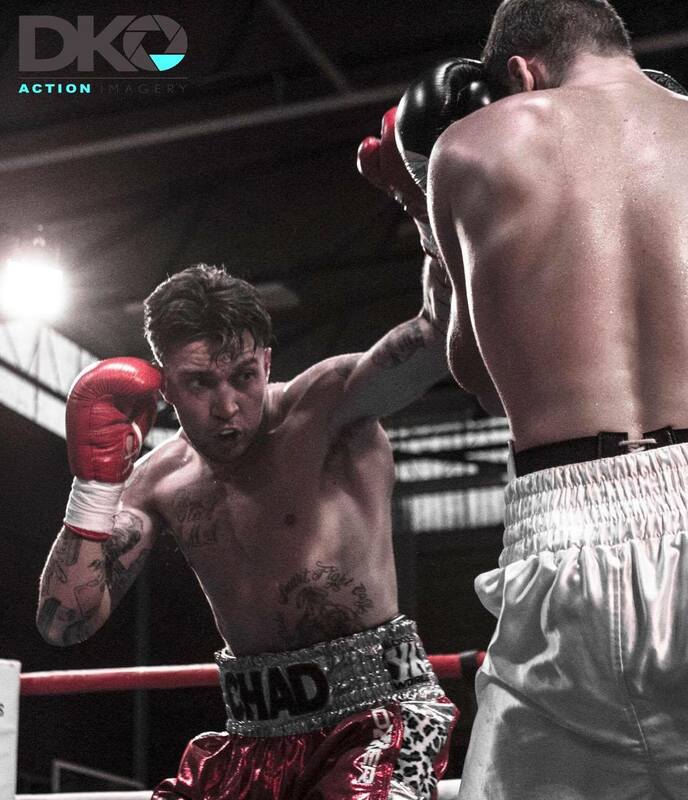 Chad Sugden was back with a vengeance on Saturday 24 June, stealing the show with a convincing win over Raimonds Sniedze on the card of Boxing Returns To The Banks. Around 200 of his fans joined the capacity crowd at Bingham Leisure Centre to support their Nottingham-born favourite in his first pro boxing bout in his home county. Living up to his ring name ‘2 Slick’, the Suggy’s Gym boxer celebrated his return after a six-month break by defeating his Latvian opponent in a contest scored 40-36 over all four rounds by the referee and judge. Fighting at Light Heavyweight, both men were comfortably within the limit. But with Raimonds ranked number one in Latvia and boasting a pro boxing record including 12 wins with 8 KOs, the match up had all the signs of being a tough ask for Chad with his own record of four wins and one loss. “There’s no doubt Chad was below par at the end of last year,” his manager and coach Dean Sugden was quick to admit. “Not wanting to let everyone down, we went ahead and took a fight in December, despite illness and an injury, and the result was a close loss for us. Keen to get back to his winning ways, the Suggy’s Gym 23-year old was delighted to finally get the chance to showcase his boxing skills on his home turf. Always popular with fight fans for being ready to take on the challenge of real live opponents, his return to the ring on Saturday attracted supporters from across the UK as well as Nottinghamshire-based fans looking forward to an action-packed local show. From the outset, applying the pressure and making Raimonds miss quickly became a common theme, with Chad landing some heavy body punches that sent his opponent reeling. The second round saw him continue to dominate and his movement, defence and varied offence were greeted by rapturous applause and cheers from crowd. The pace continued in the third and fourth with Chad going up through the gears as Raimonds tried without success to land anything. Despite several warnings, the Latvian attempted to hold but it was clear that Chad was another level and he was obviously relishing being back and getting the rounds out. Every bit as pleased as the crowd with the decision, Chad said: “Tonight was massive for me. I went to Bingham to show everyone my true skills, to prove that I really am 2 Slick, and I believe that’s exactly what I did. With offers to fight on shows in September, November and December already on the table, Chad says he will be sitting down with his dad and manager Dean to discuss the next step soon.